Exactly the same as the City Ranger 8 in almost every respect, the City Ranger 6 gives you all you need, at a more measured top speed of 6mph. Like its big brother, the City Ranger 6 is relatively light on its feet and compact in size for an on-the-road scooter. 49” in length and less than 200lbs in weight makes them both pretty nippy. 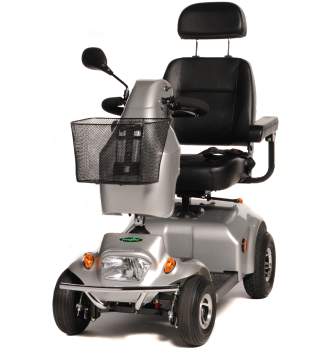 The only difference in the way the City Ranger 6 drives is the speed, making it ideal for the pavement rider, who likes the idea of speedier road riding when they need it. The beauty of the City Ranger 6 is that it comes with all the good looks and safety features you need, just at a steadier pace. Available in Red or Silver.